Diathermy was once the most popular of all rehabilitation modalities and is now, once again, becoming a popular way to treat tissue and muscle disorders. Diathermy uses high-frequency energy to provide deep heat to tissues. In 1921, Tesla and d'Arsonval won a Nobel Prize for work associated with diathermy to treat various diseases of the body. The method gained a significant following, but by the late 1950s, fell out of favor with most physical therapists and clinicians. The reasons for the decline in the popularity of diathermy are many. One was a surge in pharmacological agents that treated many of the conditions indicated for diathermy. In addition, the discovery of therapeutic ultrasound, which is considered a safe alternative to diathermy, also contributed to the near disappearance of diathermy from the rehabilitation scene. In addition, many safety issues were raised about diathermy for patients and clinicians. One, in particular, is the possible undesirable effects of shortwave diathermy on pregnancy. Finally, the diathermy equipment was large and difficult to move around, leading clinicians to seek other, more comfortable treatments for their clinics. Currently, however, the need for an effective deep heating treatment modality for physical therapy settings and the introduction of modern, more effective and safer diathermy units have led to a resurgence in the use of this method. Three types of diathermy have been used in rehabilitation: microwave, shortwave and longwave, each being named for its position in the radio frequency continuum. Generally speaking, the longer the wavelength, the deeper the depth of penetration of therapeutic heat, and the more effective the treatment. The FCC currently approves frequencies for shortwave diathermy and microwave diathermy for treatment of patients. Longwave diathermy, which is the oldest of the three types, fell into disfavor during and immediately after World War II, because of the frequent occurrence of electrical burns. In the current medical equipment market, shortwave diathermy is most popular, since its wavelength offers a deeper, safer more effectively penetrating treatment. Shortwave diathermy can increase soft tissue extensibility, decrease pain and muscle spasm, and accelerate collagen tissue repair. Recent studies indicate that diathermy also may stimulate healing in cartilage and bone, as well as collagen. Additionally, it can reduce pain and promote tissue healing. It also can be commonly used to treat patient discomfort. 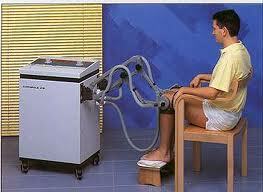 Therefore, pulsed shortwave diathermy often is the treatment of choice. MedWOW offers a comprehensive selection of new, used and refurbished shortwave diathermy systems from an array of manufacturers and distributors throughout the world. As the main global eCommerce platform for all kinds of medical equipment, MedWOW features a comprehensive searchable catalogue that allows you to filter for make, manufacturer, continent, condition, price range, seller’s business type, frequency, maximum output and more when looking for the shortwave diathermy device best-suited to your particular medical facility. Currently MedWOW features shortwave diathermy units from the following manufacturers: Birtcher, Bosch, Bosch & Sohn, Chattanooga, Cosmogamma, Ems, Enraf-Nonius, Gaymar Industries, Gbo, Henley, International Electro Medical, Mettler Electronics, Olympus, Rank Stanley Cox, Siemens, Spacelabs Burdick, Tecar and Tur.